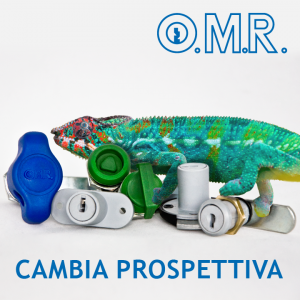 Another important innovation of the O.M.R.’s family are the new locks and closing system in the technopolymer material. Changing perspective to reach new big goals is the never-ending strategy adopted by the company: following this idea O.M.R. realized the “engineering plastic” selection. The new line of products has nothing to envy die-cast metal locks since it maintains the same security and stability levels, adding innovative features, moreover at lower prices. This latest kind of finishing enable to integrate the closing system in every furniture design with a broad range of colours and a pleasant touch sensation. Among the many distinctive features rises the extreme lightness compared to the classic metal locks,allowing application in conditions where weight makes the difference, an high resistance to adverse climatic conditions and a particular wear resistance that avoid the formation of anti-aesthetics crowns or loss of gloss on the surface. The difference is only in the new material that can be used to realize the entire existing range : from the typical wafer camlocks to the quarter turn locks, from the models for drawers to those for swing doors.. Thanks to the great production flexibility of O.M.R. you can also ask for customization of products according to specific requirements.